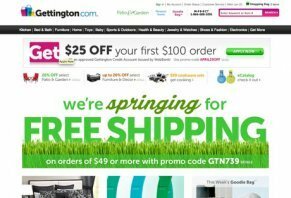 Gettington.com is an online retailer offering more than 20,000 clothing and house-ware products, and is focused on helping families stay within their budget. Based out of St. Cloud, Minnesota, Gettington.com is an online retailer offering a wide variety of products, including men’s, women’s, and children’s clothing and accessories, kitchen and bath goods, fitness and sports items, baby and children’s products, electronics, furntiure, and much more. According to Gettington, they are “…all about the family, and we are family just like you.” With this in mind, the company makes a concerted effort to connect with their customers, by providing budget-conscious products through a hassle-free shopping experience. Gettington.com features more than 20,000 products that families of all sizes can use, while encouraging interaction with their customers. For example, Gettington awards customers who share the site via Facebook, Twitter, and even email, by providing a 10% coupon whenever friends or family members click on the link, who will also receive the same 10% discount. In addition, Gettington.com states that they contribute to random acts of kindness by sending virtual “Goodie Bags” to customers, which can include special merchandise, promotional codes, links to secret sales, and even freebies. The company encourages customers to check their goodie bags often, as they tend to contain expiration dates. Fast Option – Gettington’s Fast Option helps customers repay their loans more quickly, and with lower payment amounts. Their current APR is 14.90%, which means that less of your hard-earned money goes toward interest. Easy Option – Gettington.com’s Easy Option extends repayment over the course of 24-months or less. This option includes a higher APR than the Fast Option, which is currently set at 19.90%. However, payments are segmented into 5.5% of the total balance, or $20.00, whichever is greater. Gettington believes that by providing flexible repayment options, they not only help families budget more accurately, but also gives customers an incentive to continue purchasing from them. Just like any other credit card, Gettington.com allows customers to pay the remaining amount owed for particular products or their balance in full, without penalty. However, unlike a traditional credit card, Gettington’s credit department regularly reviews a customer’s account several times each year to qualify for credit line increases, as long as the account remains active and payments continue to be received on time. In addition, their grace period is typically longer than 24 days. Gettington will process a refund or exchange for most items, as long as they are returned within 30 days of purchase, in like-new condition. Returns after the 30-day period require prior approval. It’s important to note that the company does not provide refunds of any kind after 180 days, and shipping and handling charges are non-refundable. Customers who have questions about refunds should contact Gettington directly at 866-688-1091. They inflate the prices of their stuff so much that it's ridiculous. Why would you pay $50 for a $15 item? You're better off saving your money and buying something for retail instead of making inflated payments on the inflated prices here. They are awful. They overprice their products and supposedly do periodic credit checks and adjust your credit limit accordingly and don't send out any notices. I've been a customer for five years and they just decreased my credit limit even though my credit score has been going up. When I called customer service, they treated me like crap. Once it's paid off, I'm never dealing with them again. I've reported them to the Better Business Bureau. I have been a customer with Gettington for years now and never had a problem with anything. I bought game systems, laptops, KitchenAid mixer, and an outdoor grill. All of which are still working perfectly. The game systems I bought was the PS 3. When it came out, Gettington was cheaper than most places, even with all the finance charges. The laptop was on sale, and it was something needed for college. The KitchenAid mixer was cheaper with Gettington than any store by $100. The latest things I've bought was an Xbox One and an Oklahoma Joe's smoker/gas grill combo. Yes, I could have bought these items from Walmart a bit cheaper. But Gettington allows me to stretch my money a little bit farther. It's actually a big help to those who get paid once a month. When I purchased that, they charged me California sales tax, which I think is illegal. I'm from Pennsylvania, not California. Besides, they don't have any distribution in Pennsylvania...our sales tax is 6%, not 8.5%. I purchased a bed from them only to discover this bed is a hazard. I told customer service they told me to contact the manufacturer. I can't use this bed because there is a nail sticking out of the headboard. No one has called to check on me or my baby, nor have Gettington tried to resolve this issue. My baby was only seven months when he was injured. Good products but over priced. Way too much for shipping and handling. I should have checked all the negative comments online before I purchased a laptop from Gettingon.com. When it arrived, I was unable to use my headphones, so I IMMEDIATELY returned it and, yes, they did replace it. BUT, that was the only good thing they've done! After 2 years, the replacement laptop needs a new motherboard. I wrote to the principal of Gettington and to the Executive VP, COO and CDO of its parent company, Bluestem Brands, Inc. TWICE and received absolutely no response whatsoever. There are other places to buy from on the internet. Perhaps, if people stopped buying from them altogether, they'd treat their customers better. I don't know why there are bad reviews of Gettington but I love shopping with them. I've never had a bad experience yet and they are way cheaper than places like Fingerhut. In my opinion, the prices are comparable to like a regular store such as Wal-Mart. However, Gettington credit plans have much lower interest rates than retail stores. Well, I absolutely love shopping on their website and will continue doing so despite what others said. I love having lower interest payments and my credit score has gone up from making on time payments, so I'm happy and that's all that matters. Stay Away. I purchased a sofa for my daughter moving into her first new apartment. The sofa price was great and was a good quality sofa on sale for $299. However, by the time it was all said and done it cost me nearly $700. If I wanted to spend that much on a sofa I would have gone to the local furniture store for something more elaborate than a small apartment sectional sofa. Here's what happened. I purchased the sofa online. After delivery I was informed that the delivery charge was another $150. Since I set this purchase up on a line of credit with this company, I worked with their customer service to set up automatic payments each month. After 5 months of payments, I received a call out of the blue telling me I was late on my payment. After explaining that there shouldn't be any late payments as my account is set up for automatic payment each month, they told me that auto-payment I set up expired. It was only good for 5 months and that I must have made an error setting up the payment schedule. I was asked if I wanted to reset the payment schedule. I figured if I was going to go through all that hassle I would just go ahead and get the payoff and pay the full balance, assuming it would be around $350 or so. I almost fell on the floor when they told me my balance was $607. I asked how that was possible after paying for 5 months. How could my balance be more than it was prior the payments they've received. He told me that when my automatic payments were set up that the payment date was scheduled three days after the due date so I've been being charged a late fee every month. I confronted him asking why I wasn't notified of any late fees or why the person that worked with me would have set up a payment date that would be late every month. He would not answer the question. I asked to speak with a supervisor. Can you believe he asked me why I wanted to speak with a supervisor? Duh! I told him I felt I was, at minimum, owed a credit for the late fees. He then - FINALLY - offered to credit back late fees. Wow - he offered me a $60 credit. At this point I was so mad, I just wanted to end the relationship all together. I went ahead and paid the ridiculous new balance of $547.67 and asked them to close my account and remove me from all mailing lists and to never contact me again. Do not do business with these rip off artists. Just got off the phone with customer support for the third time. I ordered an exercise machine on December 11th and still had not received it. When I talked to customer service exactly one week ago it was decided that I would wait until the 5th to check back and if it had not shipped yet, I would then cancel the order. When I called today to see if it had shipped I was told that the manufacturer canceled the order because "I had moved and it would be shipped to the wrong address!" Although we are planning a move soon, I have not yet moved. I waited 56 days for a delivery and still did not get the product and someone took the liberty of cancelling my order for me before it should have been. This is the first time I have ordered from Gettington and I am sorely disappointed, I will never try to do business with them again. Do yourself a favor and do not fall victim to their scams. They send duplicate orders and you are responsible for shipping charges. Write a Review for Gettington.com !